The remake doesn’t trump the original. Heck, it doesn’t even match it. Virtually a shot-for-shot remake of the 2007 British film, this African-Americanized take on the farcical Death At A Funeral offers very little new for those who saw the original. Yet, considering that 2007’s Death had a rather anemic $8.6 million gross, the odds are most of the viewers that turn out for this version will be first-timers. With fan favorite comics Chris Rock (who also co-produced), Martin Lawrence and Tracy Morgan toplining this boisterous but generally desperate slapstick comedy about a disastrous family funeral, it should have no trouble blasting past its predecessor at the box office (probably in the first two days). Best hope for recoupment will come from urban areas. DVD prospects are even brighter if consumers don’t get confused by the competing versions on display. With screenwriter Dean Craig returning to repeat his duties it should come as no surprise that some viewers may be experiencing déjà vu just a scant three years later. Aaron (Rock) is a frustrated novelist burdened with organizing his father’s funeral while trying to deal with a lot of competing agendas from grieving family members. This situation is stressful without the hallucinogenic drugs on the loose, the blackmailing gay dwarf and a very successful and arrogant younger brother, Ryan (Martin Lawrence), who has the writing career Aaron craves. Also on his mind is his wife, Michelle (Regina Hall), who is heavily pressuring him to father a baby. Director Neil LaBute cuts back and forth between the various characters and situations that make up this farce including domineering mother and widow Cynthia (Loretta Devine); cousin Elaine (Zoe Saldana); Elaine’s nervous white boyfriend, Oscar (James Marsden), who has accidentally been given acid instead of valium by her brother Jeff (Columbus Short); an advancing ex BF (Luke Wilson) and crotchety Uncle Russell (Danny Glover) who is being wheeled around by dopey family friend Norman (Tracy Morgan). The hijinks really soar when a mysterious gay midget, Frank (Peter Dinklage nicely repeating his role from the original), arrives with photos and a deep dark secret about dear old dad that he offers to keep only in return for $30,000 from the brothers, just as a drug-induced and totally naked Oscar climbs out on to the roof threatening to jump. With virtually all the action taking place at the house where the funeral is held, LaBute has his hands full keeping the pace going but still manages to make good use of the set and the revolving, escalating tensions the guests are experiencing. Surprisingly neither Rock nor Lawrence are very funny in their mostly straight-laced roles, leaving the film’s biggest laughs to Morgan (particularly in a tasteless but undeniably riotous scene involving Uncle Russell’s sudden attack of explosive diarrhea) and to the whacked out Marsden who plays it for all its worth. Glover appears too dignified to effectively sock across the loopy Uncle, but Devine nails the grieving widow bit with nifty timing. The biggest problem is there doesn’t seem to be a burning reason to remake this frenetic but minor British trifle, except as a naked grab for money. After a big opening weekend followed by predictably tepid word of mouth the 11 credited producers and exec producers may be wondering why they bothered. 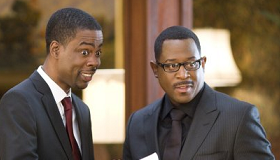 Cast: Chris Rock, Martin Lawrence, Tracy Morgan, Loretta Devine, Luke Wilson, Regina Hall, Zoe Saldana, James Marsden, Keith David, Peter Dinklage, Danny Glover and Columbus Short.